Since my husband is following a strict diet due to “fitness” maintenance, I always try to think of simple and healthy recipes and dishes for him. 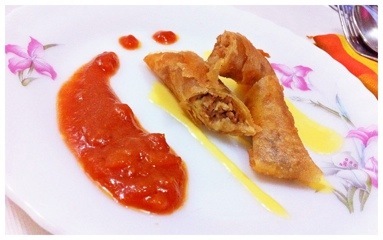 “Chicken Roll-Ups with Pomodoro and Cheese Sauce” is like your ordinary Fried Spring Roll with a twist. Check out how I reinvented this simple recipe into a mouthwatering dish that your kids will enjoy eating as well. *Saute garlic in olive oil. *Add the ground chicken and saute until cooked. *Pour 1/2 cup of soy sauce. Simmer until the liquid dries up. *Set aside and let it cool. *Put the lumpia wrapper on a plate and using a tablespoon, take 2 scoops of cooked ground chicken and a few slices of Magnolia Quickmelt Cheese. Roll and fold each side to avoid spillage. *Cook the tomatoes in olive oil. Press the tomatoes until juice comes out. *Season with sugar and salt to taste. Make sure that the sweetness of the sauce stands out. *Let it boil for 5 minutes. *Pour the milk in a saucepan and let it boil. *Add the Magnolia Quickmelt Cheese and stir until it melts. Spread the cheese sauce on the plate before placing the cut Chicken Roll-Ups. Add the Pomodoro sauce on the side. You may refer to the above picture. *Makes 10-12 servings (3 sticks per serving). I will try this for my little boy 🙂 he loves lumpiang shanghai so I think he would also love chicken roll ups 🙂 thanks! I am sure your little boy will love this!